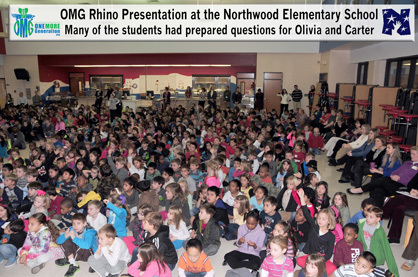 Olivia and Carter were recently invited to come and present at the Northwood Elementary School. School Principal Dr. Ritu Ahuja, and Asst. 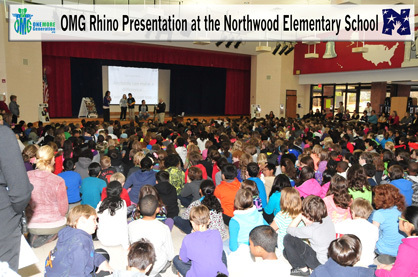 Principal Ms. Nikol Boyd, invited the kids to come and share their story about how they started OMG and about their latest initiative the Rhino Letter Writing Campaign. The presentation was scheduled for first thing in the morning and the kids needed to get up by 5:00AM in order to make it to the school which is all the way on the northside of Atlanta. Carter and Olivia worked hard preparing for the big event. They have made many presentations over the past 3 years but this was their largest audience of their peers. As we set up and completed our sound-checks, the auditorium began to fill with bright-eyed students who were all anxiously looking on stage at Carter and Olivia and wondering what they had in-store for them. Before we knew it, the auditorium was filled with over 750 students and all their teachers and school faculty. Olivia and Carter were a bit nervous at first but as soon as they started, the entire auditorium became completely silent as all the students listened intently. The students all had note pads with them and they jotted down questions they had for us as they learned about the severity of Rhino poaching in South Africa. 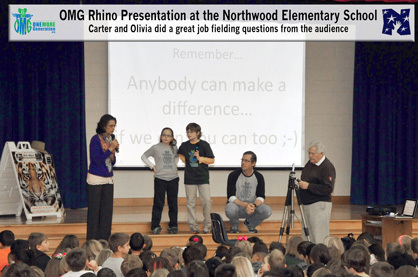 After the presentation was complete, Olivia and Carter fielded as many questions as they could before the students had to return to their regular classes. We collected all the questions that we never got to answer and Olivia and Carter spent the next week, personally writing down the answers to all the questions. We also received a video from two students who were in the audience and were so moved by Olivia and Carter’s presentation that they went straight home that evening and asked their parents if they could make a YouTube video about what they learned and their feelings on the subject. I hope you like their video as much as we did and we will be showing this to President Zuma as well when we meet with him. Our original goal was to try and collect 1,000 letters from people all over the world who would help us ask President Jacob Zuma to get serious about stopping poaching. So far we have collected over 2,000 letters and more are coming in daily. 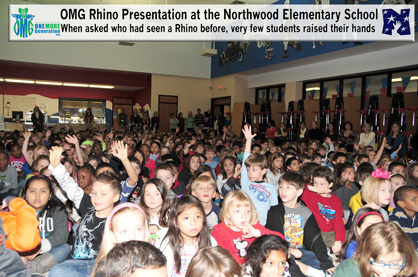 We also recently partnered with an amazing organization in South Africa called Rhino SA (South Africa) which is reaching out to schools throughout South Africa and bringing conservation awareness to students and helping them understand that each one of us is responsible for what happens to all of God’s creatures. So far they have also helped us collect over 2,000 letters with more and more schools signing on to help. Thanks to their efforts, we will be presenting over 4,000 letters to President Zuma and the great video from Julia and Julia. Olivia and Carter are very impressed with all the hard work the entire team at Rhino SA has been doing over the years and we are blessed to have them as part of our campaign. Make sure you visit their website and read about their RHINO SA Kilimanjaro Climb and about all the other conservation initiatives they have lead over the years. We are now in the process of reaching out to the South African Government and formally requesting a meeting for Olivia and Carter to meet with President Zuma so they can personally hand him all the letters to show him that the whole world is begging him to help save Rhinos before it is too late. If you have not already heard, Olivia and Carter were recently invited to go to Chicago and be on the Steve Harvey TV show. The segment is airing on Friday March 15th at 1:00PM EST. You can check to see when it airs in your city/state by clicking on the following link: Steve Harvey Air Times. Make sure you watch to see what Steve does for Olivia and Carter, you won’t believe it (we still don’t). I will tell you that he worked with the folks at South African Airways and they will be taking us back to South Africa to meet with President Zuma. We can hardly believe it ourselves. Vietnam’s deadly rhino horn trade from ITV News on Vimeo.